The headlines all paint a fairly dour picture for Baidu Inc (ADR) (NASDAQ:BIDU), and traders have certainly taken notice of the fact that BIDU stock has broken under some key support levels. By all accounts, the Baidu selloff could be (and arguably should be) about to go from bad to worse. And yet, I find myself in the other side of the table, with the minority. That is, I’m actually bullish on Baidu shares here, expecting a bounce sooner than later. I’m not, however, terribly interested in taking such a chance until something very specific happens on the BIDU stock chart. Baidu’s COO and artificial intelligence leader Qi Lu is stepping down after less than two years on the job. The former Microsoft Corporation (NASDAQ:MSFT) executive only commented “Due to personal and family reasons, I am no longer able to work in China on a full-time basis” in an official statement. The media, of course, had a field day with it, filling in the blanks with their own suppositions, and opining that the company’s AI efforts could falter going forward. It’s a problem, only because the company has spent the past year becoming an AI-centric company, largely under the guidance of Qi Lu. Under his tutelage, the company developed smartphone-bases artificial intelligence assistants and launched an impressive conversational AI. That conversational tool even served as the backbone for a smart display prototype. The depth of Baidu’s commitment (the so-called Google of China, by the way, in that it’s the dominant search engine there) to artificial intelligence extends beyond the development of some clever AI tools, however. In March it spun off its streaming video service iQiyi, Inc (NASDAQ:IQ), and it’s starting to look for potential buyers of its ad and web tools business called Global DU. It is, in effect, burning the boats. It remains to be seen if Baidu will still be the same great AI power play it has been thus far with Lu calling the daily shots, but analysts and onlookers are concerned. The 14% loss BIDU stock has suffered since the announcement says most investors have the same worry. So what will it take for me to say this selloff is one to buy into? Admittedly, I was fully prepared to say the response was yet another overreaction from the market, and an opportunity to scoop up shares on the cheap before the masses realized Baidu is still a great artificial intelligence play. Believe it or not, everyone can be replaced, and a company is bigger than any one person working within it. A funny thing happened with BIDU stock shortly after the selloff though. Rather than finding a technical floor at a convergence of moving average lines between $242.70 and $245.40, Baidu shares have fallen below, and stayed below, that zone of support. Maybe that means nothing. We’ve certainly seen shares fall below all of those key moving average lines before, only to snap back before slipping into a full-blown downtrend. We’ve not quite seen this particular scenario before though, where there’s been a ton of volume behind a pullback, and where so many likely support lines have converged into one narrow band. If you take a step back and look at the bigger picture, this action may all be just part of a transition from a net-bullish to a net-bearish environment for the stock. It’s a process rather than an event. To that end, even if a move back above the upper edge of what’s become a ceiling (the $245.40 mark) takes shape, don’t dig in too deep. We can see that past few breakout thrusts have all ended with selloffs, and that was before Baidu’s AI ambitions were called into question. If anything, it’s even more vulnerable to profit-taking now. 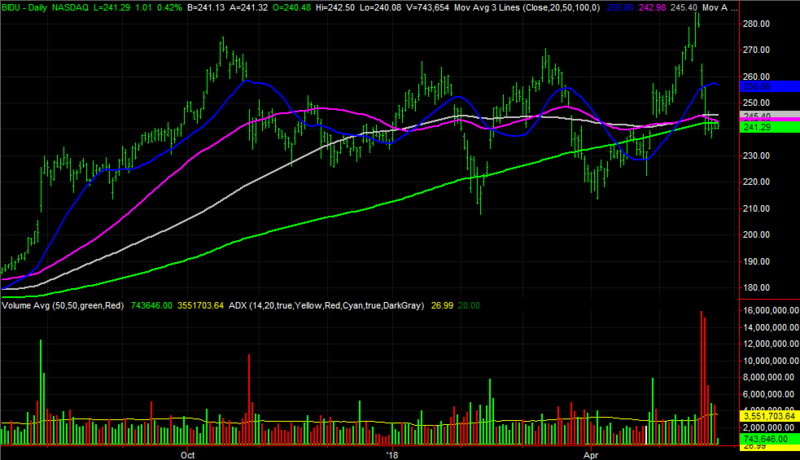 That’s why you might want to consider taking profits if and when BIDU stock manages to get back to the $270 area. Conversely, a move below the recent low of $236.61 could be a sign that the remaining bulls are done trying to keep the stock propped up. Anything between here and there may not be worth trading. The post There Still Are a Few Good Reasons to Hang on to Baidu Inc Stock appeared first on InvestorPlace.